The PONANT Kimberley May - August 2020 series of 10 to 13-night voyages has been released. An exceptional opportunity to explore one of the remotest regions on earth, simply stunning in size, breathtaking in colour, home to saltwater crocodiles and extraordinary in its wealth of indigenous rock art. “Set sail on Le Lapérouse, the most modern and ecologically responsible ship in the region, an intimately sized, 92-cabin ship, for a voyage along one of the most spectacular coastal regions in the whole of Australia. There are compelling reasons to explore this huge land, larger than the State of Victoria, by land, sea and air, and so PONANT has combined these three options to give our guests a range of experiences like no other”. “Our top-tier expedition team, a key element in getting the most out of any Kimberley trip, is headed by experienced adventurer and award-winning wildlife photographer Mick Fogg. A 20 year veteran of over 300 expeditions he ranks the Kimberley in his top three remote area destinations”. Mick Fogg: “It’s like nowhere else on earth, a wild land of remote, spectacular scenery spread over vast distances, it’s the Antarctica of the tropics. The sheer size and age of the landscape is humbling and it is a privilege to experience such a pristine environment, home to the oldest continuous culture on earth, the world’s largest living reptile, the only two ‘horizontal falls’ on the planet, the world’s largest inshore reef and the largest population of migrating humpback whales on the planet. One of the world’s last great wilderness areas, and one of Australia’s greatest natural assets, it is a destination that everyone should experience at least once in their lifetime”. With over 1,200 kilometres of coastline and more than 2,500 islands, the small luxury expedition cruise ship Le Laperouse is the perfect base camp from which to explore by sea. Regular Zodiac excursions will get guests close to King George Falls, the Horizontal Falls and Montgomery Reef providing spectacular encounters with nature at her best. By land. There are only a few places along the coast that can be accessed from the land over difficult 4WD tracks. On Le Laperouse, Zodiac excursions will take guests ashore, accompanied by 11 expedition team members, for walks to the top of King George Falls and to view rare Wandjina and Gwion Gwion rock art. “Seeing is believing. It is one thing to see these beautiful images in a book or brochure but it is totally different to see them in-situ, especially when the dreamtime stories are revealed by local indigenous custodians. These are humbling experiences,” reflects Monique. And also by air. No less than four opportunities, all optional, to see this big brown land from an overhead perspective. One, a helicopter flight to the beautiful 4 tiered Mitchell Falls. The second, a flight over the mythical Bungle Bungle Range of beehive rock formations. A site literally like no other. 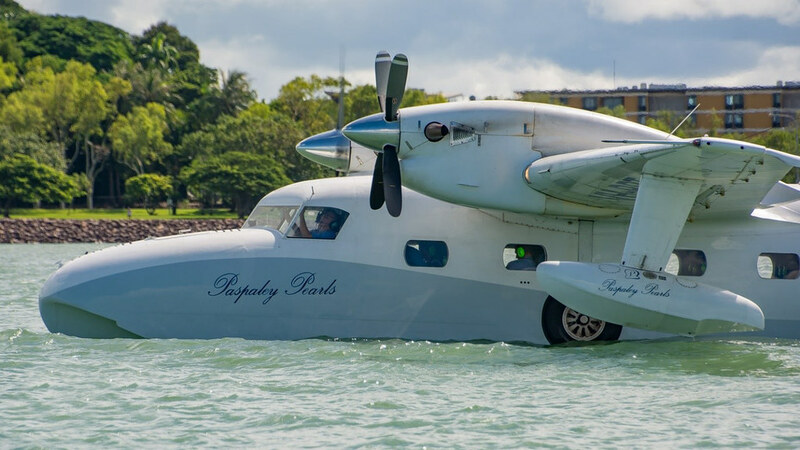 The third and fourth, a PONANT exclusive: the chance to experience scenic flights onboard Paspaley Pearls’ vintage twin-engined amphibious Grumman G-73AT Mallard aircraft. * There will be two opportunities to participate in this amazing experience - at Vansittart Bay and at Talbot Bay. * Built between 1946 and 1951 only 59 are reported to have been built. Paspaley operate three of the remaining fleet.